The petition, with 740 signatures of groups and activists from around the world, was sent by us to the Korean Consulate at the United Nations on Thursday. The cover letter (pictured above) has been reprinted in several Korean newspapers along with the full list of names. See it here. It was a small gesture on our part but an important one to help in this effort to show support and solidarity with these detained activists in Korea. One thing I noticed was that in places like the Czech Republic and in Italy, where they are also organizing to stop US military bases, the people in those places completely identified with the plight of the Koreans. Here are the words from Vicenza, Italy where a huge campaign has been resisting the expansion of a US Air Force Base. The Pentagon says the bigger base is needed for expected military operations in Africa. "We are pleased to forward the support of the Presidio Permanente No Dal Molin, Vicenza , Italy. We feel very close to you and to the Korean Friends. Even in Italy, during the last few months, and even yesterday, the Government has been implementing new restrictions under the cover of 'National Security'. In several cases it’s easy to feel and see how 'National Security' is an excuse and a strategy to try to close the mouth to citizens and movements that still have the courage to express their opinions. South and North Korea should be proud to have people dedicating their life to the goal of national reunification without militarization. Thank you for your resistance. We are with you." 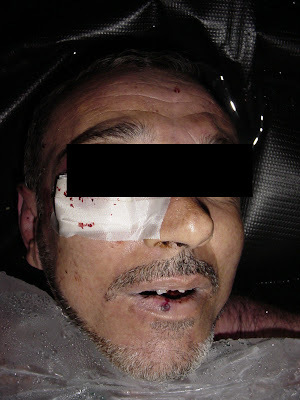 Some of the disputed torture photos, that Obama was going to release but changed his mind, have been made public by media in Australia. See them here. The American Civil Liberties Union has gone to court to try to force Obama to release them. In a new article investigative journalist Jeremy Scahill writes, "As the Obama administration continues to fight the release of some 2,000 photos that graphically document U.S. military abuse of prisoners in Iraq and Afghanistan, an ongoing Spanish investigation is adding harrowing details to the ever-emerging portrait of the torture inside and outside Guantánamo.... the investigation could for the first time place an intense focus on a notorious, but seldom discussed, thug squad deployed by the U.S. military to retaliate with excessive violence to the slightest resistance by prisoners at Guantánamo. "The force is officially known as the the Immediate Reaction Force or Emergency Reaction Force, but inside the walls of Guantánamo, it is known to the prisoners as the Extreme Repression Force. Despite President Barack Obama's publicized pledge to close the prison camp and end torture - and analysis from human rights lawyers who call these forces' actions illegal - IRFs remain very much active at Guantánamo." Obama has also announced that he will revive military tribunals which he once criticized while Bush was in office. "Military commissions have a long tradition in the United States," said Obama in a statement. Yes, and so does US imperialism, torture, assassinations, and government lying and deception. It becomes harder every day to distinguish the Obama pirate foreign policy from his predecessor. The vote in the House of Representatives on the Iraq-Afghanistan-Pakistan wars supplemental spending bill took place yesterday afternoon. More than $97 billion was approved for the remainder of 2009. Rep. David Obey (D-WI) led the floor debate for the Democrats side and basically said the money was going to do no good, the whole Afghanistan war was a mess, but we've got to give our new president a chance. All I could think about was the 95 kids who got killed last week in a US bombing raid.....how many more kids will die during the next year while guys like Obey "give Obama a chance"? It was the weakest excuse for leadership I've ever seen. The final vote was 368-60 with 200 Democrats supporting the funding. The Republicans congratulated the Democrats for finally coming round to their side and putting together a "bi-partisan" war funding measure. They were gloating of course, loving that the Democrats, now firmly in control of the government, were accepting ownership of the wars. Of course the Democrats had been supporting Bush's war funding requests for years, but always rhetorically bashed Bush for getting us into the wars. Now the Dems own them and have to do the heavy lifting. Much to our pleasant surprise in Maine our two representatives, Mike Michaud and Chellie Pingree, voted against the war funding. So, while it is a hollow victory, it is a reward of some sort for our hard work to turn our state against these endless wars. Now we have the tough job of convincing our two Republican "moderate" senators (Snowe and Collins) to do the same. Always another boulder to push up the hill. Coincidentally we had an anti-war meeting in Portland last night to figure our next steps following our successful town hall meeting early last month. We are planning a statewide meeting on June 13 to develop strategy. Friends in the northern parts of Maine will join with us from the midcoast and southern regions in order to increase our ability to build opposition to this huge waste of resources and human lives. I watched much of the war funding debate on C-SPAN yesterday and it was quite an amazing thing to see that most of the discussion was not about war. Should we expand into Pakistan? Should we have a plan in Afghanistan? Should there be a timeline? These key questions were largely glossed over. In fact most of the debate was about Guantanamo. Should Obama close Guantanamo? Should the prisoners there be brought to the US? Should they be released to walk freely on the streets of America and shop in our malls? I kid you not.....it was all about fear making. During the 15-minute vote in the House they took calls from listeners on C-SPAN and the vast majority of the calls had nothing to say about the war funding issue - instead they were fixated on "terrorists roaming the streets of America." I realised that neither the Dem or Repub leadership really wanted to have a no-holds-barred debate on the funding for multiple wars. So just like professional TV wrestling they played good-cop bad-cop and had a stormy debate about Guantanamo prisoners. Thus the attention of the people was effectively diverted. The war parties got what they wanted. The American people got hoodwinked. DOCTORS & NURSES FIRED UP! Dr. Margaret Flowers speaks at a rally held in Washington of single-payer health care advocates. She was recently arrested, on May 5th, at the Dirksen Office Building, for speaking out at a Senate Finance Committee where single-payer advocates have repeatedly been denied a voice in hearings. A national day of action for single-payer has been announced for May 30. Events are being planned nationwide. Want single-payer? Want to take the profit out of health care - do you agree that health care is a human right? Then please rattle your chains and help make this happen. As the ranks of the unemployed grow daily in the US many more go without any health care coverage. The Obama "public health care plan"? Have the government subsidize the insurance corporations to cover those without it.....just more of the same that would keep the rich fat cats in control of the system. Doctors and nurses, people that work directly in the system, are telling us that is not the right prescription. Here in Maine there will be a statewide rally on Saturday, May 30 at the state capitol in Augusta at noon. Mary Beth and I have been invited to speak - to make the connections between endless war and the waste of our resources that could go for a real health care program in this country. It's exciting to see doctors and nurses leading this movement. We all need to stand with them - solidarity forever. Global Network board member Sung-Hee Choi spoke at a news conference in Seoul, South Korea yesterday in support of the six reunification activists who have been arrested by their right-wing government. 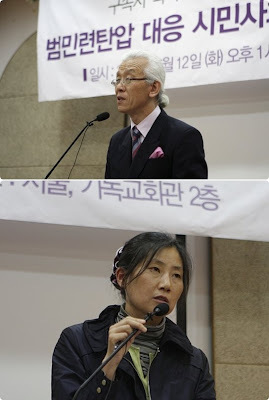 Sung-Hee told about GN efforts to gather signatures of support from around the world for the jailed peace workers. Last call for signatures on the petition in support of Korean reunification activists. It's become a huge issue in South Korea with hundreds of progressive organizations extending their support to the six targeted people. I've already collected petition signatures from all over the world and throughout the US. Send me an email today at globalnet@mindspring.com if you want your name/organization/city/state/country added to the list. You can see some great photos from the Seoul news conference here. Word came out yesterday from Washington that Speaker of the House Nancy Pelosi was not going to allow a vote on Rep. Jim McGovern's (D-MA) resolution calling on Obama to give a timeline for leaving Afghanistan. Pelosi does not want to "embarrass" the president by having such a resolution considered even though it only had 50 co-sponsors and was not going to pass anyway. The House Progressive Caucus also has decided not to stand against the $94 billion war supplemental for Iraq-Afghanistan-Pakistan. The go-along-to-get-along crowd has taken control of Congress. I was supposed to tape the next edition of my cable TV show today but my guest, Jerry Call from Rockland, Maine, got himself arrested yesterday in Washington DC. Jerry is a leader in the single-payer health care movement here in our state and felt moved to head to DC for the second hearing by Sen. Max Baucus (D-MT) who chairs the Senate Finance Committee which is holding a series of public hearings on Obama's health care plan. Sen. Baucus has so far refused to allow anyone representing the single-payer idea (supported by a majority of American citizens) to testify in his hearings. Yesterday 20 nurses stood and turned their backs on Baucus as he began the hearing and then five people stood and made statements and were arrested - including Jerry. This was the second hearing where Baucus had a string of health insurance corporate executives testify but no one was allowed to represent the other side of the tracks. One more hearing is scheduled. In my personal Gen. Jones Watch: Obama's head of the National Security Council, former NATO Commander Gen. James Jones told ABC News the other day that air strikes will continue in Afghanistan, "“We can’t fight with one hand tied behind our back....We’re going to take a look at trying to make sure that we correct those things we can correct, but certainly to tie the hands of our commanders and say we’re not going to conduct air strikes, it would be imprudent,” he said. 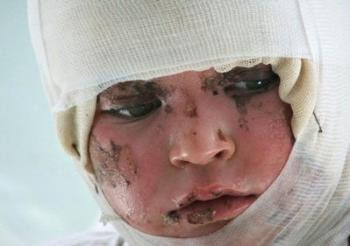 At least 95 kids were killed by the US in the recent bombing that killed over 140 people in Afghanistan. Their hands are now dead. The Pentagon's secret "Black budget" has now grown to more than $50 billion a year - the largest ever. That is more than Russia spends on its total military operation each year. Much of the black budget goes for developing new space warfare and spying and surveillance technologies. A few years ago a journalist who writes for Janes Defense Weekly wrote a book on the US's black budget. He wanted to discover its origins. He traced it back to Hitler's Nazi operatives who were doing secret weapons technology work during WW II. Fifteen hundred of these Nazi's were brought to the US after the war under the program called "Operation Paperclip" and brought the architecture for the black budget with them. Security Watch reports that, "Top secret details of America’s missile defence system were found last week on the hard drive of a computer purchased on eBay. Information on the hard drive included a document outlining test launch procedures, blueprints of government facilities, and photographs of employees together with their personal details, including social security numbers. Lockheed Martin, who make the missile defense system in question, declined to comment on leaked hard drive." Here is the CBS TV's "60 Minutes" story on Unmanned Aerial Vehicle's (UAV). It is not a critical piece of journalism but is simply a piece of war promotional propaganda. These systems (called Predator and Reaper) are the ones killing so many civilians in Afghanistan and Pakistan today. The reason the Pentagon gave "access" to 60 Minutes to do this story is because of the growing numbers of innocent people they are killing. This propaganda piece is to reassure the American people. Designed to show us that the Pentagon is careful to ensure the sanctity of life. These "stand-off" weapons, controlled from satellites, are flown by soldiers using remote controlled joy-sticks while sitting inside Creech Air Force Base near Las Vegas, Nevada. It's war from space on the cheap. These space directed systems for modern warfare will be the theme of our Keep Space for Peace Week this coming October 3-10. See our new poster here. You can order the poster for $3 each or five for $12. As I write this I am listening to Pandora, an on-line music service that allows you to pick your favorite artists and they find their music and similar tunes....I've got it set on The Kinks, Rolling Stones, Bob Dylan, the O'Jays and have got it doing a mix of all their stuff. Earth, Wind, & Fire are singing "That's the Way of the World" ..........heavy emotion running through my heart. I've been adding groups and individual names this morning from Japan and around the US to the petition supporting the South Korean reunification activists. Going to fax it tomorrow to the Korean United Nations mission. Then today I got an email from Syria about the arrest of civil society activists there....the repression of the people yearning for justice and peace is global and heart breaking. Last night Mary Beth came running in the door and told me to turn on Maine Public Radio. As she was driving home from work she heard them promo an upcoming story about peace groups in Maine calling on our members of Congress to vote against the Iraq-Afghanistan-Pakistan war supplemental which is now up to $97 billion for the remainder of 2009. (Obama is requesting $130 billion in 2010 for war funding too.) I had sent around a news release the night before calling on our representatives to vote NO when it comes to the House floor on Thursday. Maine Public Radio called me in response to the release and did a nice story. See and listen to it here. Maine Public Radio also interviewed our Congresswoman Chellie Pingree and she said she's not yet decided how she will vote on the war supplemental. She was elected in the last election, to a large extent on a peace and social spending platform.....she will most likely vote for the war funding. Since she has been in DC we've seen her work hard to bring billions of dollars more in military spending to Maine. Another liberal Democrat who says one thing and does another I'm sad to say. What we get in return for this additional war money will be more civilian casualties like the young girl above for Afghanistan. We've become a killer nation without a conscience. As long as it creates "jobs" here at home its just fine with the liberals running the show in Washington. Out of site - out of mind they believe. Please let me know if you'd like your name (and/or organization) added to the following statement in support of six South Korean activists who were arrested by their right-wing government on May 7 for their efforts to publicly support the reunification of South and North Korea. One of the activists, Choi, Eun-A was on the Korean organizing committee that did such a wonderful job of hosting our Global Network space organizing conference last month in Seoul. 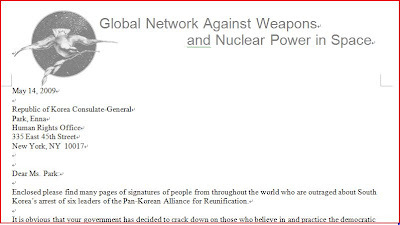 Send me an email at globalnet@mindspring.com if you would like to be listed on the statement which we will send to the South Korean United Nations Mission early this week. Be sure to include your city/state and country. 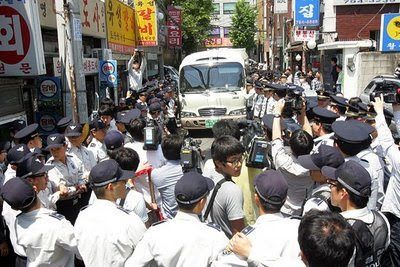 We, the undersigned, are outraged to hear about the May 7, 2009 arrests and detention of six South Korean reunification activists by their government under the “National Security Law”. Lee, Kyu-Jae; Lee, Kyeong-Won; Jang, Yoon-Kyeong; Yoon, Joo-Hyung; Oh, Soon-Wan, and Choi, Eun-A should be released immediately and a public apology should be given to these peaceful activists, to their families, and to the people of South and North Korea. It is our understanding that for many years the Pan-Korean Alliance for Reunification (PKAR) has worked openly to create peaceful dialogue between South and North Korea with the hopes of bringing the country together again in a positive way. We applaud their efforts. The time has come to end the mindless militarism that continues to divide the Korean peninsula. Those people who work to that end should be applauded for their efforts, not arrested and treated with such humiliation.